Good news: primaERP is better again. If you have multiple users in your primaERP account, you will certainly like the Team Table export feature. Tables can be exported to PDF, XLS and CSV formats. If you were missing a field to insert Payment info, you can find it now in your Account settings section. 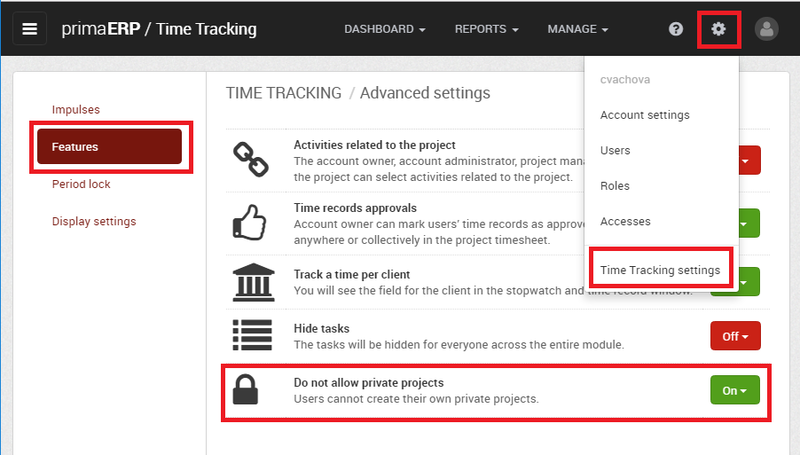 The last new function allows to not enable private projects in the Time Tracking settings section, and was requested by several administrators. Why we have developed this feature and how to change a private project into a public one is explained in the article below. Chris, the boss, is in troubles: His subordinates often create in their primaERP Time Tracking private projects assuming that they can share them with others. Yesterday for instance he was angry at Mark, whose timesheet for a certain project Alpha was missing. “But I have recorded those hours,” says Mark in his own defense showing his boss the report in his own laptop. Yes, the time has been really tracked, but on a private project. It has not happened for the first time. Therefore Chris contacted the primaERP support to ask for advice. Why couldn’t he, as admin, get access to private projects of his subordinates? He is the boss after all! All of us at primaERP fundamentally disagreed with that idea. 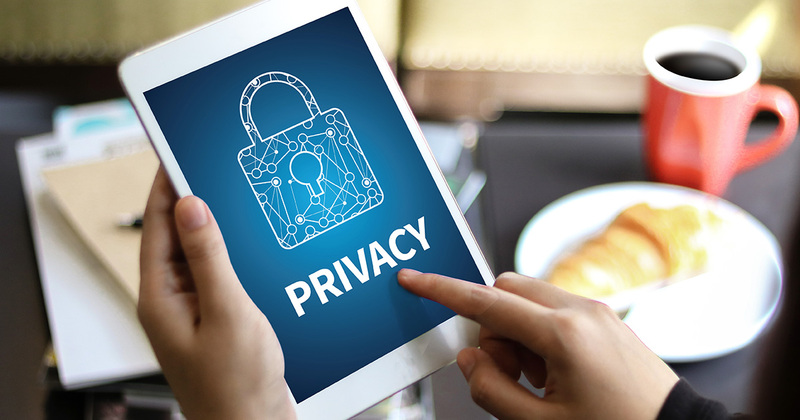 It is the matter of privacy of you, our users! You got used to track the time you spend working for individual clients. Why couldn’t you apply your time management skills in your personal life? It will help you to improve your use of time and consequently quality of life. Private projects are there for you to track time related to your private affairs. That's none of your boss's business! Back to the issue in question, Mark, the user, certainly did not intend to conceal that he had been working hard on the new Alpha project. Quite the opposite, all along he really wanted the boss know! However, Mark has not found the particular project in primaERP. As a "go for it" kind of guy, he decided to create the project himself. Unfortunately, he has overseen both the ticked checkbox next to the word “Private” and the warning “Be careful, you are creating a private project! Only YOU can see the time records related to it!”. The checkbox “Private” has been ticked automatically, because Mark does not have the Time Tracking project manager role assigned to him. Mark of course does not want to copy all the time records for the last two months on a public project. 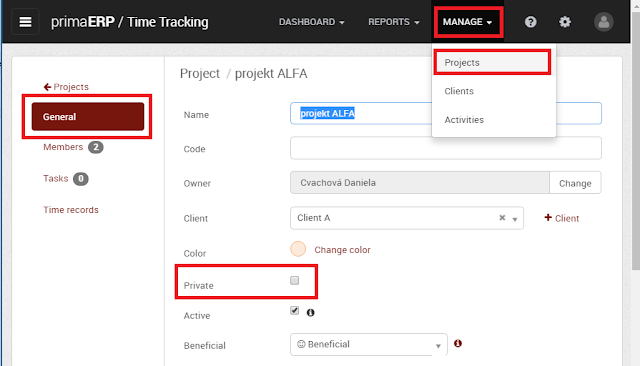 Given that Mark is the only person working on the Alpha project and no public project has been created in primaERP yet, Mark can go to "Projects" under "Manage" and fix the issue by unchecking the “Private” checkbox. In order to do that, he has to ask the administrator to assign him (at least temporally) the role of Time Tracking project manager, which enables the user to create and edit public projects. In the "Members" section Mark will then select whether he wants to invite all users to the project or to just select some of them. 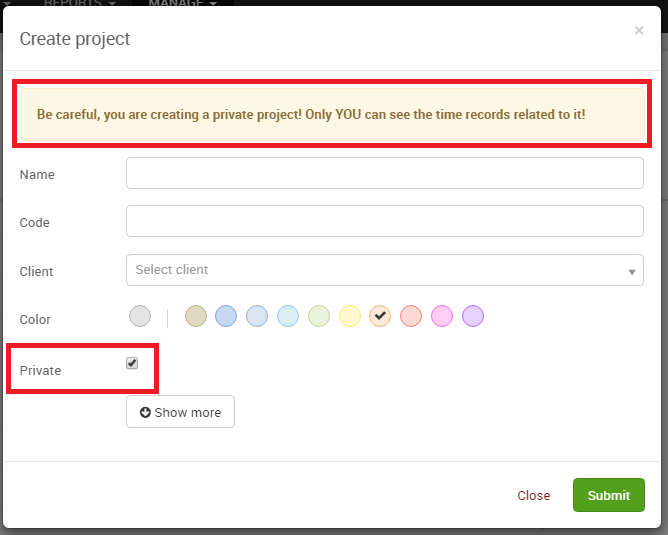 In case there already was a public project created for the same purpose, where other members would be entering their time, it would be better to move data among projects using bulk changes as is shown in the separate article Bulk changes: How to transfer time records between projects. As for Mark, he can at any time create a free account at www.primaerp.com for his private use so he can, for instance, track if he spent more time spent with his family or in the pub. Start earning a high SAT score with this!